When Hot Wheels first announced the beloved Volkswagen Karmann Ghia was in development and would be released in the 2006 First Editions, collectors were enthralled with the possibility of adding this unique car to their collection of Hot Wheels cars — it was the #VW fans that got real giddy. See, it was the Volkswagen Karmann Ghia that really stood out from the automotive crowd, and still does today. It was a very affordable European-style sports car that sold from 1955 to 1974. It featured the chassis and a modified-engine from the Volkswagen Beetle, along with the Euro-styling of Italian car designer, Luigi Segre. Shortly after the announcement of the Hot Wheels VW Karmann Ghia was made, the Hot Wheels poster image of this new Ghia had surfaced. 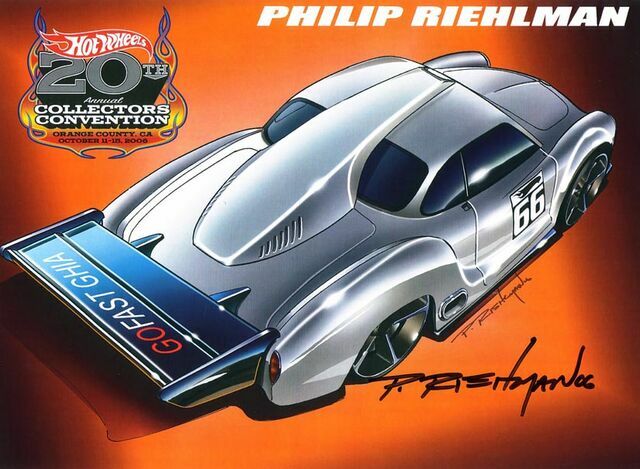 When Hot Wheels designer, Phil Riehlman did his take on the classic sports car, he made it into a modified race car. Classic car lovers everywhere fell over in disbelief as they could not believe Phil messed with the classic design. The Hot Wheels enthusiasts who understand that Hot Wheels are “Customized California Miniatures” ended up loving the race-inspired Ghia, but some still clamored for an unmodified VW Karmann Ghia casting even after having one already in the more detailed, 100% Hot Wheels adult collector line. Since we now had a race-inspired, mainline casting, it was dubbed the “GOFAST GHIA” due to the saying written on the spoiler in one of Phil’s drawings. As collectors waited until the end of the 2006 Hot Wheels year, it wasn’t until the last case code or so that the Ghia finally showed up as part of the #2006 First Editions. For some reason, the Ghia and the ’55 Chevy Panel were able to get limited mainline releases at the end of 2006 even though it was clear that these two castings were destined for premium lines. Since it briefly appeared on a limited basis in the 2006 First Editions, the Ghia has been relegated to the premium lines. It was this #First Edition Ghia however, that started it all off. The metal-body/metal-base is great and combined with the removable engine cover and wing, has made this one of the most underrated Hot Wheels castings to date. RELEASE DETAILS: Silver Body (metal). Light Blue Tinted Windows. Black Interior. Chrome PR5 Wheels. Black Base (metal). Made in Malaysia. Toy# J3279. Released in 2006 as #38 of 38 in the 2006 First Editions.